Spectacular Prime Beach Front View! Spacious Corner Unit! Kanai A Nalu has been rated The Best Vacation Property in Ma'alaea. Spectacular ocean vistas are guaranteed in this specially designed condominium building. 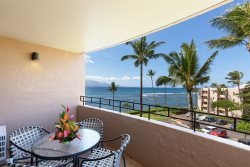 This CORNER UNIT #417 faces the ocean and has a lanai featuring uninterrupted views of Ma'alaea Bay, Kihei, Wailea, Makena, Upcountry and Haleakala. Spectacular whale watching from the lanai during whale season. Plus, you can watch the sun come up over Haleakala (Maui's dormant volcano, which rises 10,000 feet above sea level. The complex is CENTRALLY LOCATED on Maui. It's approximately 1/2 mile from the Aquarium, the harbor, grocery store, restaurants and shops. Our condo is on a dead-end street so there is very little traffic and it is very QUIET. There is absolutely no traffic noise from the main road in our unit. You can enjoy deep relaxation inside or on the lanai, at the sandy beach or at the beautifully manicured lawn with tropical landscaping downstairs. When you first enter, you will be greeted with the magnificent view of the ocean beyond the living room. Not many condos are available this close to a sandy beach, where you can swim or snorkel....RIGHT IN FRONT of the building (weather and ocean conditions permitting). In the morning, you can take a walk along the quiet sandy beach (miles long toward Kihei). This is possibly the most uncrowded beach on Maui. There is also a government protected Wildlife area near the beach for endangered sea turtles, so no development is allowed here. This is for sure one of Maui's finest beaches! *Kanai A Nalu #417 has a new California King Tempurpedic bed in the Master bedroom and now has a King bed in the second bedroom also. Condo sleeps 4 maximum. *One of the few HEATED POOLS in winter and outdoor barbecue facilities *Full kitchen *High Speed (Wireless & DSL)Internet *A/C & 3 ceiling fans *In unit Washer/Dryer *One 42 inch flat screen TV in living room and one 32 inch flat screen TV in master bedroom. * VCR/DVD player *Approx. 20 minute drive to charming HISTORIC LAHAINA TOWN *Approx. 12 minute drive to Kahului AIRPORT on a modern 4-lane highway *MA'ALAEA SMALL BOAT HARBOR offering a myriad of water sports and activities *Approx. 2 minute drive or 10 minute WALK distance to the NEW MAUI OCEAN CENTER. *Maui Ocean Center's first class AQUARIUM with a clear under water tunnel is top rated the best attraction for FAMILY. *Approx. 2 minute drive or 10 minute WALK distance to Maui GOLF & SPORTS PARK features Miniature golf, Bumper boats, Rock climbing, X-treme trampoline and Parties. (Right next to the New Maui Ocean Center.) *Neighborhood is adjacent to Ocean center,there several fine dining and family RESTAURANTS to choose from. The harbor features restaurants, Hula Girl's Cookies & Ice Cream, and the Pacific Whale Foundation. The Ma'alaea Harbor boats run daily on snorkeling and sunset cruises, winter Whale Watching trips. *Approx. 15 minute drive to K mart, Lowes, big supermarkets, Costco.....for DAILY SHOPPING *FREE PARKING only steps away from condo *2 large elevators in the building. Whether you want to get away from it all for a little R&R, or you want to experience everything there is to offer on Maui, Staying at Ma'alaea Village is the solution! You will fall in love with this terrific Top Floor condo. This corner condo unit is located on the top floor of Kanai a Nalu which is considered by many to be the best condo building in Ma'alaea Bay. There are breathtaking views and the sound of the waves to help lull you to sleep. This condo is very quiet and very private place. What more can you ask for? Enjoy breakfast on your lanai and if you keep your eyes on the sea, you can do some whale watching at the same time. Go for a swim in the deep blue ocean that is only a few steps away, or stretch out by the pool. Do you like to take a stroll along the beach? Well, you can do that too, it goes on for miles in complete serenity. The condo has been professionally decorated with quality Hawaiian flavor. It’s a place to come back to time after time. Be sure to click on the 'Virtual Tour' button... Of course we have cable TV and high speed Internet access. Better than I expected. Sound of waves very pleasant. Location right on beach just what we wanted. Great for walking or snorkeling. My wife spotted lots of sea turtles and we enjoyed sunny solitude. Would return for sure. Perfect! The pool was warm just the way I like it. The beach was perfect for my 7 year old granddaughter. The view was beautiful. The condo was clean and supplied bogie boards . The location was close to the airport, kehi and Lahaina. Had the best time ever. loved this Condo! everything you need with views that don't quit! The view was amazing! I love that the beach is just steps away. Condo was fully equipped and the beach gear was used daily! Another bonus was that the sun rising didn't wake me up earlier than I wanted to by blaring in the bedroom window. That's huge for me haha. But overall, we loved this condo and will definitely be booking this place again. Year after year Im sure. The view !!! This condo is very nice. Perfect location, amazing view, Very confortable bed / fourniture and well stoked with all you need. Its clean and well decorating. I Go maui are very attentive and make sure we are confortable. We had a wonderful vacation. Perfect location! The location is perfect. Between Lahaina and Wailea. The ocean is at your door step. The condo itself is great. It had everything we needed and more!! It was super clean. We had no issues with bugs at all. The ceiling fan failed our last night and the staff was very responsive, friendly and communicated. We had an extra fan (we never ran the a/c). Perfect! We loved this unit! It was so Clean and updated! The views of the ocean we amazing! Our next trip to Maui we will definitely consider staying in this same unit. Wonderful condo with all the necessities. Our family of four enjoyed our stay at the condo very much. There are beach chairs and boogie boards in the guest closet which we enjoyed very much. There is shallow reefs right in front of the condo, but the park right to the south of the condo has an area for boogie boarding without being right on top of coral. The condo is in a great central location for all the sights on Maui. There was plenty of kitchen supplies, dishwasher pods, laundry pods, trash bags and toilet paper for our 7 night stay. Thank you so much. Clean all inclusive condo Great place to stay in Maui! The best view on the ocean and full of gear for the beach (chairs, boards, cooler). We would definitively rent it again! Beautiful view This condo is everything it is advertised as. It was clean, great view, and conveniently located. They even had beach chairs, umbrella, towels, etc for a day at the beach. Well stocked unit in great location in quiet part of town. We had a fantastic time here. The views were stunning. Loved seeing turtles in the water from the balcony. Enjoyed the beach chairs and cooler in the room. Too beautiful for words Can you describe paradise? Neither can I. This property has everything you could want and avoids the congestion of Lahaina. It is centrally located on Maui and is truly beachfront.